The Gas Riva Vision Large stove has an eye-catching glass-fronted door and glass plinth and is available with either a white stone or highly realistic log-effect fuel bed. Together with Red, Clear or Black glass bead fuel bed options, you can customise your Riva Vision to suit your own taste. A wide choice of interior linings is also available depending on your choice of fuel effect – choose from vermiculite, black reeded or highly reflective black enamel. To increase your interior design possibilities, you can opt for a contemporary stove bench or black gloss flue pipe (conventional flue only). 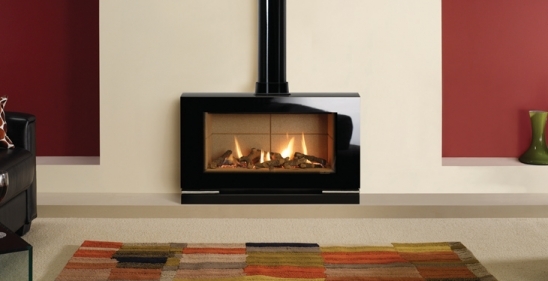 These are the perfect complement to this stylish stove. You can have the choice of conventional or balanced flue installations and the thermostatic remote control gives you complete control of the stove from ignition to thermostatic and timer controls.